Those are words of the Executive Director for College Football Playoffs, Bill Hancock. He made that statement back in September. 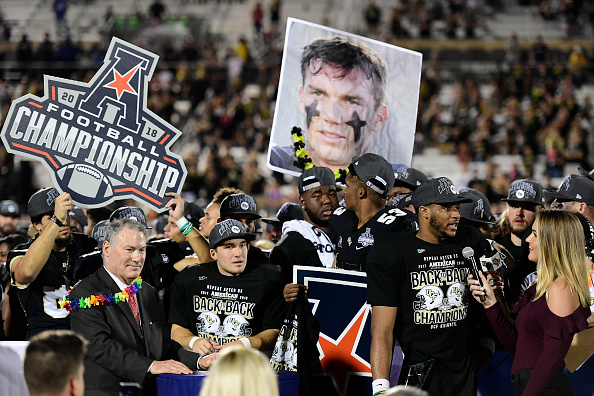 The UCF Knights have made their statements for the last two years. On Saturday, it wasn’t just the 25th consecutive win, it was one for the ages. Trailing by 17 at halftime and after surrendering three first half turnovers, it was looking rather ominous for the home team. After the emotional victory in Tampa last Friday, which followed with quarterback McKenzie Milton spending all week in the hospital, a letdown would not only be understood, but expected. Milton’s number 10 jersey was prominently displayed throughout the stadium. Fans were draped with thousands of leis to celebrate their injured hero. Everyone was playing for No. 10. But early on, it looked more like Memphis was playing against 10....as in 11 on offense and 10 trying to defend. The holes for the Tigers running game were gigantic. Memphis ripped off touchdown runs of 62, 70 and 82 yards all in the first 18 minutes of the game. Darrell Henderson entered the contest 301 shy of 2,000 for the season. He needed 265 to break DeAngelo Williams’ single season record. At halftime, Henderson had 207 rushing yards and three touchdowns. At the end of the game, he had 210. As the Knights motto for the season exclaims, “Believe it Done!” They believed and somehow found a way to get it done. So, is there really a path to the playoffs? If so, that’s a road that even Google maps can’t locate. I don’t think any UCF fans truly believe the committee will select them on Sunday but they do enjoy antagonizing the system that continues to hold them down. And while Bill Hancock preps his “Mambo Power 5” routine, in true Lou Bega style, to explain to the world why going undefeated is not quite enough, UCF continues to fly the flag for all the underdogs. UCF coach Josh Heupel echoed those sentiments. Earlier in the season, Darriel Mack had the opportunity to start against East Carolina. It was Heupel’s decision to rest a very sore Milton that has proven to be rather prophetic. While the Knights sweated out a close road victory that night, the experience Mack gained clearly paid dividends in the last two weeks. Mack finished with six total touchdowns to claim the American Athletic Championship Most Outstanding Player award. After the game, his first call was from Milton. “I just got off the phone with him before we came here. He was just telling me he loves me, he’s proud of me,” Mack said.